Print out this coupon and present it when you purchase a Glade Spring Collection product and receive a second product for free. This offer is valid until July 31, 2011. One coupon per purchase. Some additional conditions apply. Click here to print the Glade free Spring Collection product coupon. 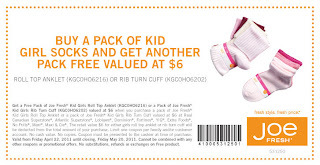 Joe Fresh is offering a buy one pack of roll top anklet or rib turn cuff girls socks and get the second pack for free. 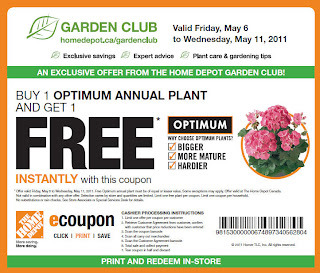 This offer is valid until May 6, 2011. Simply present the coupon at checkout and the discount amount will be subtracted from the total. Limit of one coupon per customer. Some additional conditions apply. 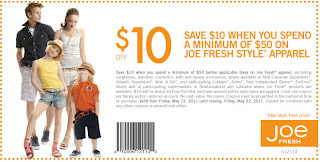 Click here to print the Joe Fresh free pack of girls socks coupon. 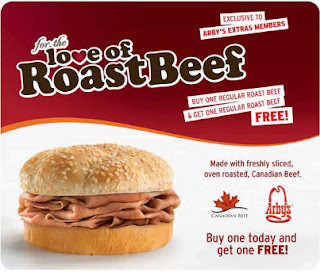 Head out to your nearest Arby`s for lunch, buy one Regular Roast Beef Sandwich and get one free. Present this coupon when you make your order. There is a limit of one coupon per customer per offer. Some additional conditions apply. Click here to print the Arby`s get one free coupon. Whether you`re planning to make a gift or just buy one for your mother, Michaels definitely has what you need. From April 25-29, Michaels is offering 25% off your entire purchase including sale items. This offer is valid at Michaels stores only. Simply surrender this coupon at time of purchase. One coupon per customer per day. Additional restrictions apply. Click here to print the Michaels 25% off coupon. 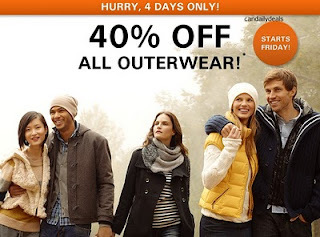 Click and print the coupon below to get 40% Off all outerwear at any US and Canada Espirit retail location. This is a 4 day only sale from October 22-25, 2010 and valid In-Store only. This discount only applies to outerwear and blazers and is not valid online or in outlet locations. Click here to print the Espirit 40% Off Coupon.